While all attention is fixed on Greece and how world markets will be affected post the ‘No’ vote to solve the $382 billion debt problem, a bigger loss in one of the world's biggest financial markets escaped attention untill this week. China’s stock market has lost over $3 trillion in value in less than a month without creating a domino effect across the world. Chinese markets continued their plunge this week, wiping close to 37 percent off the market’s valuation from June 12 peak. The intensity of the loss can be judged from the fact that it is nearly twice the market capitalisation of all stocks traded in India and more than the Spanish, Russian, Italian, Swedish and Dutch stock markets combined. Normally when one market falls, especially of the size of China, other markets follow suit. China in fact is the second biggest market in terms of market capitalisation but despite a 37 per cent fall in its value, Dow Jones, representing the largest market, is down by less than only one per cent in a month. World markets seem to be dancing to the tune of Greece markets more than the events in China. China’s fall is not even being replicated in other emerging markets. So why is it that China is falling in isolation? The answer is absence of foreign institutional investors (FIIs) in the country. FIIs exposure to China is through stocks listed in Hong Kong in what is known as H shares. China prevented entry of foreign investors in its country. Reuters reports that a landmark scheme linking Hong Kong and Shanghai stock markets launched last November has failed to get much foreign participation, with concerns about stock ownership and how trades are settled dogging investors. Even MSCI (Morgan Stanley Capital International) index decided to delay inclusion of China’s A share in its list of investable shares. According to Thomson Reuters data, foreign investors account for less than 1 percent of the mainland equity market as compared to nearly 25 per cent for India. Thanks to this limited exposure by foreign players directly in China, a contagion to other markets has been prevented. But this is likely to be short lived. Investors who have lost money in the recent market crash are retail Chinese investors. Over 85 per cent of trading volumes in China is from its retail investors. A crash in the property markets last year forced many retail investors to divert their funds to equity markets. 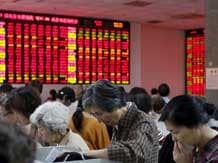 Government incentives and opening up of relaxed margin funding helped fuel the sharp rally in Chinese equity markets. Government used all the machinery in its hand including state media to urge public to invest in stocks. This has resulted in more stock market investors in China than there are Communist Party members. The Chinese equity market now has more than 90 million individual investors, according to China Securities Depository and Clearing Co, compared to the Communist Party's 87.8 million reported members at the end of last year. Most of these investors have utilised margin funding facilities and are heavily leveraged. Goldman Sachs pointed out in a report that the outstanding margin financing, at 2.2 trillion yuan ($355 billion) earlier this week (more than five times of what it was a year ago), was the equivalent of 12 per cent of the value of all freely traded shares on the market, or 3.5 per cent of China’s GDP. Both “are easily the highest in the history of global equity markets,” its analysts noted. But with Chinese shadow banks and peer-to-peer lenders also offering cash to investors, the amount of hidden leverage in the market is estimated to be as much as 50 per cent higher. Numerous steps taken by the government failed to prevent the slide. Margin funding norms were relaxed, new issue launches were cancelled to prevent investors from selling shares in the market to invest in these issues, exchange fees were lowered, pension funds were allowed to invest nearly 30 per cent of their corpus in equities, interest rates were cut and investors were allowed to even pledge their apartments to invest in the market. But none of these have worked. In the most recent move, China has infused liquidity in its market and has asked Pension Fund manager not to sell a single share from its portfolio. Late Sunday night, China Securities Regulatory Commission said that it will uphold market stability by providing liquidity to China Securities Finance, a state unit that makes margin finance available to brokers. As a result, Chinese market opened with gap of 7.2 per cent higher but have conceded all the gains and presently trade only 0.7 per cent higher. Even the state media and opinion makers were roped in to urge investors to hold onto shares for the glory of the Chinese nation but to no avail. The Economist points out that the longer term consequences of the correction are more worrying than the short term one. Economic activity normally slows down after the market falls sharply and fails to recover. China is already slowing down and the last thing it needs is a stock market crash which will impact consumption. If the market fall accelerates the economic slowdown, other countries that have not been affected by China’s market fall will be hit. After all China is the largest consumer of a number of goods and commodities in the world.